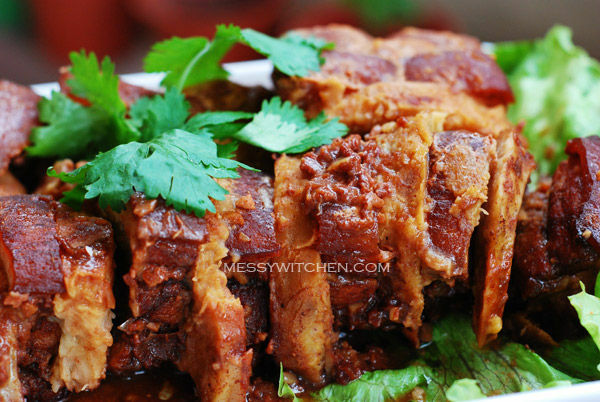 Pork belly with yam (芋头扣肉 wu tau kau yoke) is a Hakka dish and it’s one of my favorite Chinese food. 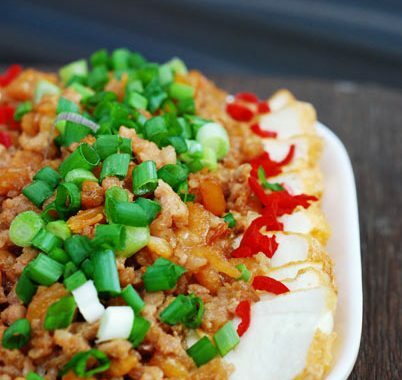 Just thinking about it ahhh… lau hau sui (salivate). Problem is not many Chinese restaurant offer this dish in their menu. Ummph maybe coz this dish is of Hakka originated and my town consist of majority Hokkien? The only place to order this dish (I know of) is at Chuan Kee Hakka Restaurant in KL which by the way the wu tau kau yoke is insanely delicious!!! The other place where I can eat this dish is ahem… right at home. Thanks to my food caterer. Hehehe! And because I love this dish so much and to satisfy my curiosity, I learned how to cook it. Gotta say I’m satisfied with the result. 🙂 Oh btw this is a great dish to make for Chinese New Year. 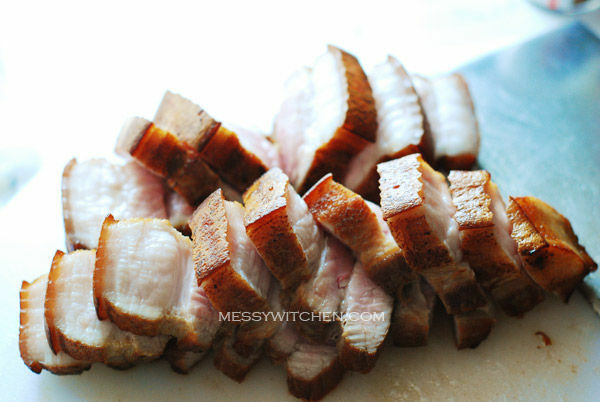 Cut pork belly into 2 slabs. 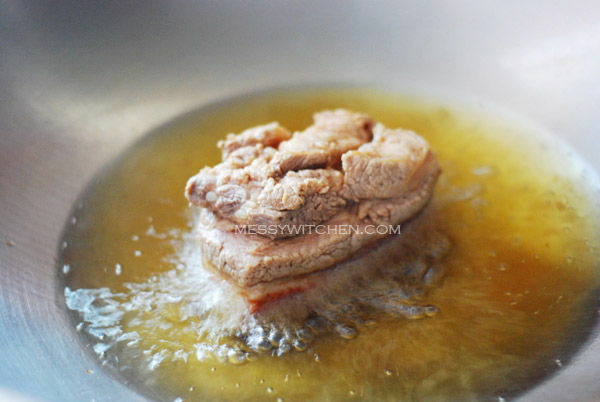 Then, blanch the pork by cooking it for about 5 minutes in boiling water and then submerge the pork into cold water. Drain the water out and then prick the pork skin and meat using a fork so that marinade can seep in. Tsk, I’ve seen some recipes method asking to submerge the pork into cold water after blanching. I wonder why? To stop the cooking? But why? Anyone care to enlighten me? Now marinate pork with light soy sauce and white pepper. Some recipes also suggest adding five spice powder here. You can try it. 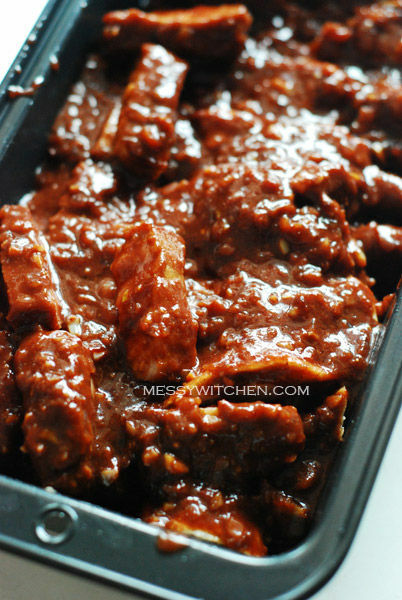 Leave the pork marinate for 30 minutes. My RM10 yam. Not sure why so expensive. 🙁 Remove the roots by slicing with a knife. Then wash once and pat dry. I wear glove after that to prevent my hand from getting itchy (due to wet yam). 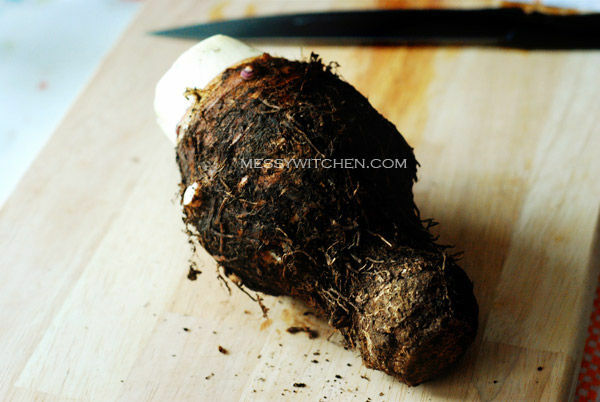 Be careful the yam become slimy at this point too (also due to wet yam). Slice yam to about 1/2 inch thick. Then, deep fry yam till light golden. 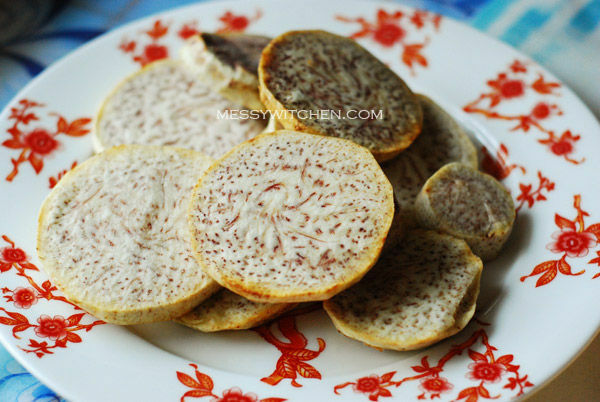 Fried yam slices. Place it aside. Next fry the marinated pork belly with skin side down first until lightly brown. Then turn over the meat and fry the other sides until lightly brown too. Once cool, cut pork into 1/2 inch slices. Then arrange pork (skin side down) alternating with yam in a loaf pan. You can use a bowl as well. I cut some of the yam into half as they are too big and besides I have more meat than yam so I need to divide the yam into half to get more quantity. With 2 tablespoons hot oil, saute shallots, garlic, fermented bean curd, fermented bean paste until oil separates. Add the rest of the sauce ingredients and cook for 2 minutes. These are the red fermented bean curd (nam yue)-left and fermented bean paste (taucu) that I used. If you find the sauce to be too thick (or salty) do add some water to the side of the dish while steaming. After steaming, leave it to stand for 20 minutes in the pan so that the dish will set nicely once inverted. Remember to garnish with cilantro as it’s the perfect accompaniment to this dish. And if you’re into adventure, take a few pieces of lettuce and place on top of the pan before inverting. The lettuce will go into the bottom of the dish once inverted. One thing I’ll do differently next time is to slice both the pork and yam to less than 1/2 inch thick. I find 1/2 inch is a little thick to my liking. This is what you get after 4 hours plus of hard work (sound difficult but it’s quite easy actually): Soft-tender-oozing with goodness pork and yam sandwich. Best eaten with rice. My parents love it. 1. 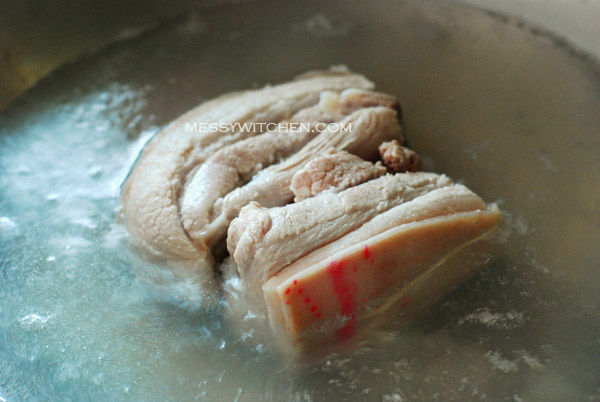 Bring a pot of water to boil and blanch pork for 5 minutes and then submerge into cold water. Drain and prick skin and meat with a fork for the seasoning to penetrate. 2. 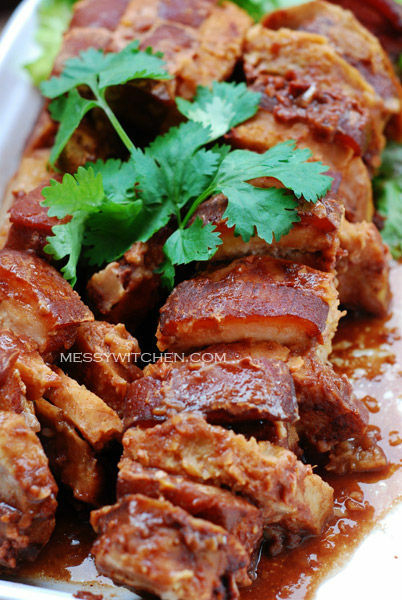 Marinate pork with light soy sauce and pepper for 30 minutes. 3. Deep fry yam slices until lightly browned. Keep aside. Then fry the seasoned pork, skin side down until pork skin is lightly brown, then turn over and fry the rest of the meat until light brown. Let pork cool and cut into 1/2 inch thick slices. 4. Use 2 tablespoons hot oil, saute shallots, garlic, fermented bean curd, fermented bean paste until oil separates. Add the rest of the sauce ingredients and cook for 2 minutes. 5. 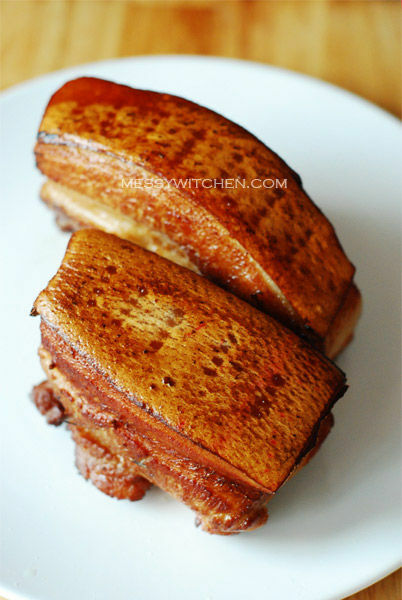 In the meantime, arrange pork (skin side down) alternating with yam in a loaf pan. Pour sauce mixture over it and steam for 3-4 hours over medium heat. Leave it to stand for 20 minutes in the pan before inverting it onto a serving plate. Garnish with chopped cilantro. For the lettuce, place on top of pan before inverting. “blanching” isnt merely boiling briefly. . .
blanching is boiling briefly and then immediately submerging in cold/ice water to halt the cooking process. I’ve edited my post. Thanks. Looks yummy! I make this every year with my grandmother. 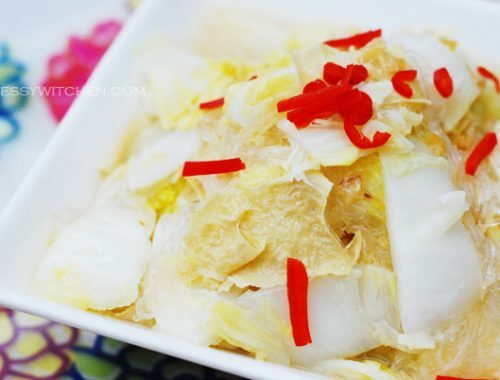 Yam gets really expensive around Chinese New Year because everyone is making these. My recipe is slightly different though. No blanching was involved and the pork was fried whole after marinating in soy sauce to give it more colour. Hi Rachel, cooking with grandmother is the best, right? Yam (certain variety) is expensive in Klang Valley no matter the seasons. I think blanching the pork before frying is to make it tender. And yeah the color is definitely lighter since it’s not marinated with soy sauce and fried after that. 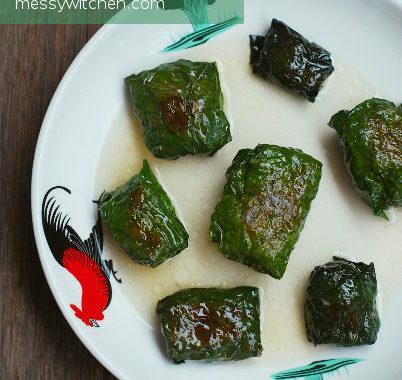 We have tried making this dish so many times but the outcome was unsatisfactory, until we stumbled upon this recipe . The taste was just what we were looking for. The secret would be the two sauce instead of just the ‘nam yee’. Thank you Messy Witchen.